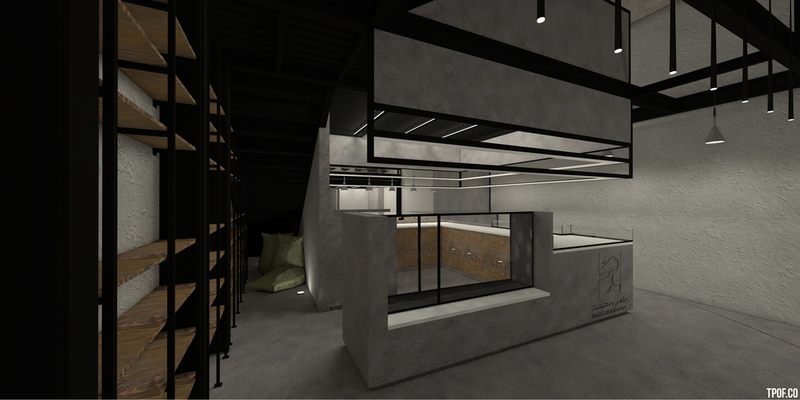 a Collaboration project between Pi Architects x Al-Merkaz for Client Medd Cafe & Roastery. | 2014-2015. The project aimed to emphasise the performance aspect of creating a perfect cup of coffee. We wanted to take the visitor through a journey when experiencing the space. At the very start we envisioned a large intersecting vertical element to counter act the long horizontal being of the site. By introducing a horizontal platform between the ground floor and existing mezzanine floor we can create a more intimate space dialogue and increase floor density. The vertical volume would act as a focal element and it would house the spaces for the performance, a sort of Vertical Stage. The Bar this space would house all the equipment for brewing and serving the visitors. The Roasterey this space would house a large coffee bean roaster machine and serve as a bagging and storage area. The Cupping Area this quiet space would be where the coffee barista taste tests his freshly roasted coffee beans in a quick sipping manner to ensure a good roast and a great tasting cup for the visitors. Various stages of vertical "focal" element placement & vigorous development diagrams showcasing Space, Circulation & the introduction of Solid vs Void. We can then subtract a void from the platform to create an interesting balance between solid and void thus increasing viewing angles of the performance. The journey then becomes traversing through the space, viewing the performance from different angles while experiencing the different kinds of visitor space. The entrance acts as a sort of indoor public space. Visitors experience a miniaturising feeling when first entering, gazing upon the verticality of the stage. They find themselves among other standing visitors. For interaction with one another and socialising is encouraged. Public space transitions into a space where interaction with the baristas and other visitors becomes deeper. The bar and bar seating a social space for conversing and meeting new people. while also being a kind of front row seat for the performance. Social space transitions into a space for sitting with people you have a close relationship with like family or friends, a more personal experience. Lastly the transition into a space for solitary use. Minimum interaction, for work or reading, a more intimate space. these spaces are provided in the form of long wooden work top tables. also used as the cupping area at the Mezzanine Level. The Mezzanine level starts with a long intimate space table also used as the cupping area to the left then continues the same dialogue as the social, intimate spaces below but also acts as a multi-functional space. The custom furniture (by Al-Merkaz ) is designed to have the ability to be put away to make space for other activities such as a public gallery space. A steel grid frame is provided for hanging artwork or partition walls to guide visitors through the space if needed. The Mezzanine level also has the best view of Jeddah's Cornish, with views of the sun set all year round.